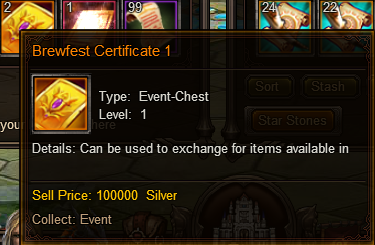 Last 2 brewfest ago, we got the start of these certificates. I got 2 left so I save them. My question is, we will be able to use/exchange this for newer ones or something. Since this brewfest is giving #2 not #1. I got 1 stored in my STASH but it says it runs out on August 11th 2015 so it out of date, so will i get the chance to swap for newer one or shall i just discard it? i see u get them if u rank high enough in brew feast. ill wait for Monopoly then. 2019-4-21 18:50 GMT+8 , Processed in 0.057327 second(s), 46 queries .